Halloween is one of my favorite holidays (second to Christmas, of course!) mainly because it's an excuse to dress up in a fun costume. I've DIY-ed a lot of costumes for myself over the years but this year you can tell my mind is consumed with all things baby because this is my second round of kids costumes! 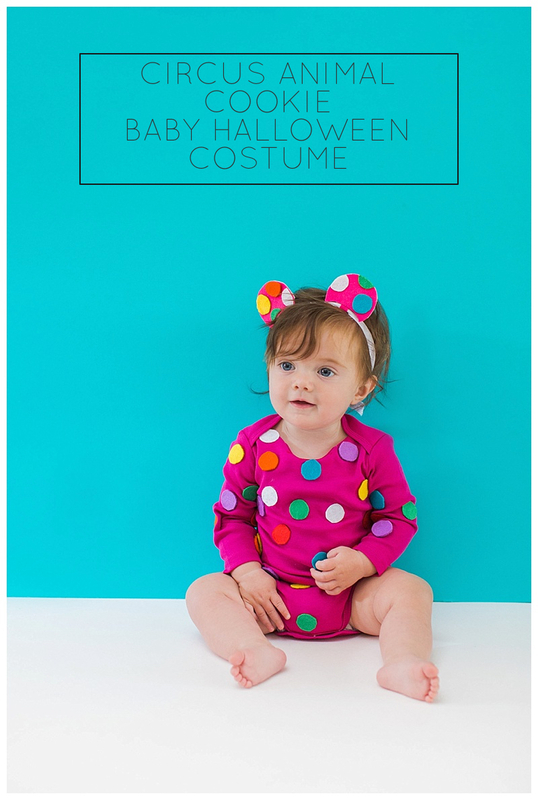 In case you missed it, I shared a fun toddler costume last week featuring Ailee's oldest daughter Isla that you can check out here! This time around I borrowed Isla's little sister Emi (almost nine months) and her cousin Milly (almost 6 months) to model these DIY Halloween costumes inspired by some of my favorite sweets! Both of the costumes started with solid color onesies from Primary. As a first time mom-to-be and serious color lover, I fell in love with the concept of Primary. They have cotton baby and kids clothes available in every solid color you could image. I foresee a lot of fun colorful costumes in my little girls future! To make the cherry headband, you'll wrap the red pipe cleaner around the pom and twist it to create the stem. Then you'll thread the headband elastic through the base of the cherry and tie the elastic ends together to the size of your child's head. I cut 1/4 inch wide strips and then cut every 2 inches to create rectangle sprinkles. Repeat with all the different color felt sheets. I used six different colors and cut 8-10 pieces of each color to cover the front and arms of the onesie. You'll take the brown felt sheet and lay it over the neck area of the onesie. The Primary onesies have a pretty distinct ribbing around the neck and shoulders so it's easy to trace the area for the chocolate dripping using the black sharpie. Along the bottom you'll wear hills and valleys to resemble chocolate sauce dripping. Then you'll cut along the lines and use the felt glue on the back of the brown felt and glue down in place. Arrange the sprinkles and secure to onesie with the glue. Trace the rim of the quarter onto the felt sheets for the sprinkles. To cover the front of the onesie and arms you'll need 6-8 circles per color. Once the pieces are traced you'll cut them out and glue onto the onesie. For the headband I drew a bear ear shape onto the sturdy pink felt, cut it out and then trace three more ear shapes so you can double up two matching ears. You'll hot glue two of the ear pieces around the elastic hairband and repeat to the other ear. Then use the felt glue to adhere a few of the sprinkles to each ear.